SVG animation support (using ecmascript). Optional SWF output using the ming library. Optional PDF output using the reportlab library. Mesh edges and silhouettes edges. 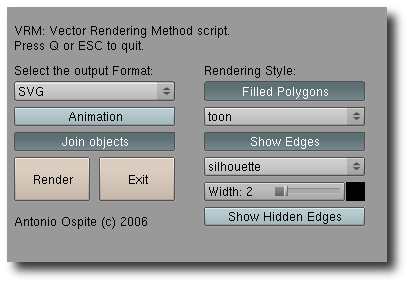 Option to choose wether or not render object joined together. Using for example the version 0.3 of the script.